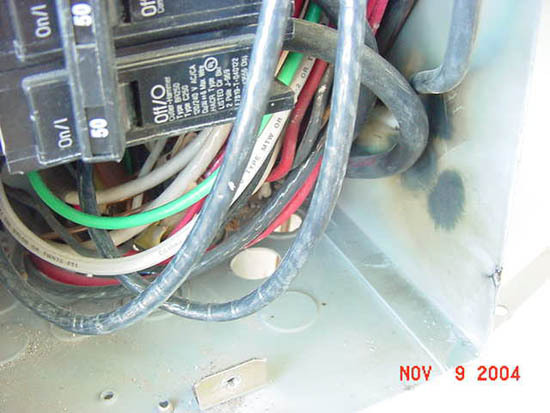 Gotta love the "ample" wire bending space in these panels. How did this junk ever get listed? Are those scorch marks I see on the bottom right-hand corner? I'd love to know the brand of the panel, that way we know to avoid buying it! How did this stuff ever get listed? Look at Zinsco and then ask the same question. looks like the cement slab below sunk causing the fittings to pull out of the enclosure , common on long island usually 2-3 years after the pour..
Looks like a GE All-In-One. Atleast thats what those slim "mini's" lead me to believe. But the bottom 2 pole is a Cutler Hammer. It is GE, full of stinkn' twins too. 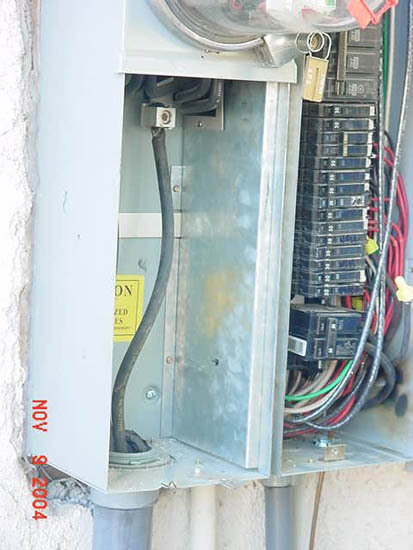 Only 1-1/2" is required for the size of conductors here if they're #8 or #6, 2" if a #4 or#3. This provides that and more. That's how it gets listed. As for the twin C/B's, these GE combination services are listed for their use, and I've not personally ever had to replace one that's burned up like a Zinsco. 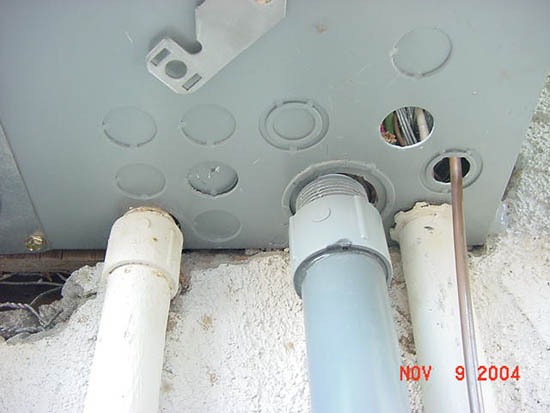 The problem here was not the manufacturer,but the installer that slapped in the 1" PVC without a locknut (it would have pulled the concentric KO out if there was one), and wasn't careful about how he routed his wire to the C/B that really doesn't belong in this panel. (Besides being not listed for the purpose) The GE's have a little cross tab on the bus, and I don't think a CH has the slot to accept it. They won't stab on the bus all the way, so some guys just break off the cross-tabs, throw them in and use the deadfront to hold them in place. Maybe a pool/spa installer that "does it all"? turkeylips ??? Thats a new one for me. It is fitting though as that Cutler-Hammer 2 pole does not belong there. Also expansion fittings would have worked nicely in this installation. We use them in the northeast due to frost heaving the ground.